Let’s talk about a game idea, and what I want to be sure I’m saying with it. 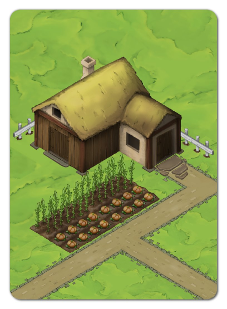 This game idea is known tenatively as cities and towns. It actually started as a colour matching/multiplier game, a math game for my nephews but I liked the metaphor of it being about things rather than stuff, and so it slowly took its shape as a town builder. The notional mechanic is that there’s a common pool of cards, the city, that determine the value of the cards in each player’s personal pool, their town. At the start of the game, you deal each player a starting card that’s not worth anything, but gives you a place to start from, and put three cards into the city, to give people a standard view of how things are valued. This means that putting cards into the city can represent an explosion of value for you, but it’s something other players can piggyback on – if you have two of type A, and there are two more A in the city, you get four points, but any player who builds an A gets two, too. I like this mechanic for representing things like trade dependencies and culture growth. A university on its own isn’t worth as much as a university surrounded by other smaller towns with universities, and a market thrives when there are other, connected markets. Players are simultaneously building the scoring mechanism for the game as they are building their own little spaces in the game. Then came the time to make the game pieces, and I hit an interesting conundrum. See, one thing I could do is go with a pastoral, adventure-game vibe, you know, the not-necessarily-fantasy, but-probably of kingdoms with farms and quarries and woodcutters, as you see in games like Settlers or whatever. 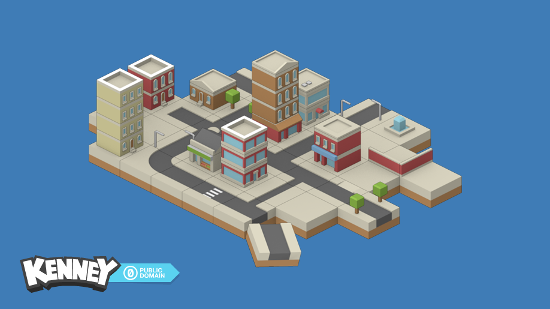 The next option, however, is to build assets using something like these Kenney assets, isometric city representation. Now this choice opens up an interesting question. I think that a modern urban city and smaller town thing presents an interesting set of different mechanics – after all, you have faster communication, and maybe there are some buildings that can’t go anywhere but in the city, and some things that can’t go anywhere but the town, because of infrastructural needs. Is there a need for variety the same way in buildings when they look modern, when they could show similar buildings on different blocks with ‘zoning’ rules? But then we hit an additional question: What about redlining? What about the history of deprivation? If these are buildings that look like cities, but outside of cities and minus the skyscrapers, am I just building suburbs? And if I am, do I really want to present a scenario to players where they want to build more schools in the city, because it makes their schools out in the suburbs more desireable? Now, I’ve made my decision – the game’s underway. But these are decisions you gotta be prepared to consider and confront. When you make a game, you are responsible for the things you choose to put into it, and the assumptions you make about what the game should have in it.